Most of us recall our mother’s orders to “Stand up straight! ” Retract the shoulders, contract the abdominals, allow the head to come back and lift the torso out of the pelvis. Unfortunately for some of us standing upright is a frustrating experience – one hip may be higher than the other, one side of the rib cage lower -the act of standing upright isn’t, quite that easy. The spine has three slight curves – one in the neck, one in the upper back and another in the lower back. These curves are normal and can be seen from a side view. From a back view, the spine should appear straight. However, when a person’s spine twists and develops an “S”-shaped side-to-side curve, the condition is called scoliosis. The abnormal curve can occur in the thoracic spine, the lumbar spine, or both areas at the same time. The curves can range in size from as minor as 10 degrees to severe cases of more than 100 degrees. The measurement of the degrees of curvature from the normal is a measure of how severe the scoliosis is. When scoliosis occurs (or is discovered) after puberty, the condition is called “adult scoliosis” to distinguish it from the curves caused during growth. Adult scoliosis can be the result of untreated or unrecognised childhood scoliosis, or it can actually arise during adulthood. Most cases of scoliosis are considered “idiopathic”, in other words doctors do not know what the cause is. This is a rigid, inflexible spinal curve and for unknown reasons, the spine just grows that way. While the spine continues to grow, there is a risk that it will continue to get worse. Scoliosis can also be congenital (present at birth) or it may develop as a result of another neurological condition such as cerebral palsy, spina bifida, or spinal muscular atrophy. What Could Cause Adulthood Scoliosis? 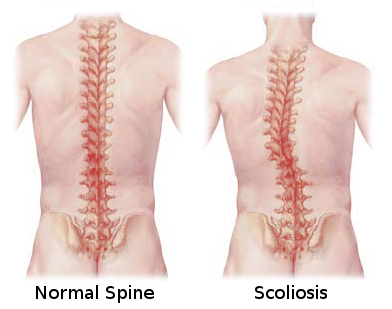 Sometimes adult scoliosis is the result of changes in the spine due to aging and degeneration of the spine. Congenital scoliosis is present at birth. Many different problems in growth and development can lead to spine problems. Fortunately, most of these are rare. When muscles do not work around the spine, the spine itself may be thrown out of balance. Over several years, this can result in a curvature of the spine developing. This type of scoliosis is often caused by spinal cord injuries that lead to paralysis. As a results of a poor muscle function due to a muscular or neuromuscular disease, such as muscular dystrophy, cerebral palsy, or polio. “myopathic deformity ” scoliosis might develop. Scoliosis developed in adulthood can be a “secondary” cause of another spinal condition that affects the vertebrae, such as degeneration, osteoporosis (loss of bone mass), or osteomalacia (softening of the bones). Scoliosis can also appear following spinal surgery. The surgery may cause an imbalance in the spine that leads to scoliosis. Research has proven beyond a doubt that scoliosis can result from various nutritional imbalances. Researchers in Hong Kong found that inadequate calcium intake and weight-bearing physical activity were significantly associated with low bone mass in AIS (adolescent idiopathic scoliosis) girls during the peripubertal period. In most cases, people with scoliosis do not experience any symptoms. Many people carry on with their lives with no idea and a scoliosis is incidentally found later. As the condition progresses, back pain can develop. The deformity may cause pressure on nerves and possibly even the entire spinal cord. This can lead to weakness, numbness, and pain in the legs. In severe cases, pressure on the spinal cord itself may cause loss of co-ordination in the muscles of the legs making it difficult to walk normally. In rare cases if the chest is deformed due to the scoliosis, the lungs and heart may be affected leading to breathing problems, fatigue, and even heart failure. There is also a risk that the scoliosis may continue to progress (especially during adolescence, when the spine is still growing). Physical therapy and exercise is an important part of treating adult scoliosis. In the majority of scoliosis cases where it is postural scoliosis or the curve is mild, an exercise program to strengthen weak muscles and stretch tight muscles will help to alleviate muscle imbalance. Learning correct body mechanics in order to maintain erect posture that counteracts the effects of the scoliosis is essential. Examples include exercises on an exercise ball, rocker board, or vibration platform. Yoga and Tai Chi are also great balancing exercises. Thera- Band Resistance Band exercises can help develop a strong and stable core that can help reduce stress on the spine, improve hip stability and posture. For moderate scoliosis or one that is increasing rapidly, a back brace might be recommended. Once you have reached skeletal maturity, bracing is used for pain relief rather than prevention. Custom foot orthotics are used to correct the alignment of the feet or a heel rise is used if there is a structurally short leg. Chiropractic care may also be recommended to the postural scoliosis patient to improve mechanical balance, flexabilty, alignment, and address any resulting pain from years of abnormal force distribution. Acupuncture can help manage pain naturally. If osteoporosis is present increasing your calcium and vitamin D intake and weight-bearing exercises is recommended. Test for Vitamin D deficiency – available through Emed! There is a significant correlation between nutritional disorders and scoliosis. During growth a balanced intake of proteins and vitamin C is essential to the support of normal collagen. The highest incidence of idiopathic scoliosis occurs in the period of rapid growth that correlates with increased needs for manganese, zinc, copper, and vitamin B6. Emed’s Mineral Status Profile will help you identify possible low levels of these minerals. Deficiencies of these have been shown to affect the expression, as well as severity of idiopathic scoliosis. Zinc deficiency can also result in defective collagen formation. Adequate magnesium level is necessary to maintain muscle balance and alleviate muscle stiffness and pain. To help prevent and treat musculoskeletal conditions such as scoliosis we have also designed the Emed’s Musculoskeletal Profile. Identifying deficiencies of nutrients (calcium, magnesium, zinc, Vitamin D, and CoQ10) essential for musculoskeletal development and function, at an early stage, will help you dramatically improve your quality of life. Spinal surgery will always be the last choice of treatment and is usually not recommended if the curve is less than 40 degrees. Lee W.T., Cheung C.S., Tse Y.K., Guo X., Qin L., Ho S.C., Lau J. and Cheng J.C. (2005). Generalized low bone mass of girls with adolescent idiopathic scoliosis is related to inadequate calcium intake and weight bearing physical activity in peripubertal period. Osteoporos Int. 16(9):1024-35.